After the Ionian Revolt of 499 BC, the Persians and their king Darius wanted to conquer Greece more than ever. Persia wanted more and more land. Also, the Greeks had helped the Ionians to revolt against the Persians, and had marched to Sardis and burned the city. 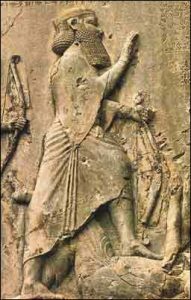 The Persians condemned the Greeks as invading terrorists. But what was the best way for the Persians to take over Greece? By land or by sea? The Persians had tried the land way in 514 BC when they attacked the Scythians. But they had lost. So this time the Persians decided to attack by sea. They decided to start from Ionia (modern Turkey) and try to conquer Athens. The Persians were especially mad at the Athenians because the Athenians had invaded Anatolia during the Ionian Revolt. Plus, it seemed like Athens might be weak, with their new democracy. Then, if the Persians got Athens, they could use Athens as a base to attack the rest of Greece. The Persians knew a lot about Athens and the best way to attack Athens from the exiled Athenian tyrant Hippias, who was living at the court of Darius now. Hippias was angry that the Athenians had thrown him out, and he was hoping to get back into power in Athens with Persian help. (The reason we know so much about this war is that a Greek historian, Herodotus, wrote a history of it not long afterward). By the fall of 490 BC the Persians were ready. The Persian ships, carrying the cavalry, sailed over to Greece, looting islands on the way. Their first stop was to take Eretria, on the island of Euboea (you-BEE-ah). When the Persians got to Eretria, the people all went inside their walls and shut the big city gates. Usually at this time people were pretty safe once they were inside their walls. The Persians didn’t have any weapons that could break down strong stone walls. But some of the Eretrians were afraid of the Persians anyway, and one of them opened a back door for the Persians in the middle of the night, and so the Persian army got in and took over Eretria through this treachery. 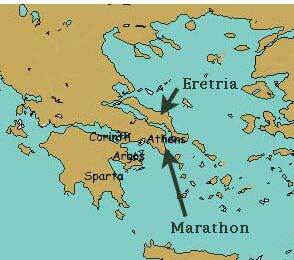 Now that the Persians had a good base at Eretria, they sailed over to Attica (the territory of Athens). Hippias advised them to land at Marathon, 25 miles from Athens. This is where Hippias’ father Pisistratus had landed in 546 BC. Hippias may have hoped that the people who lived near Marathon would help him get back into power. But in any case Marathon was one of the few places in Attica where there was pasture for the Persian horses in the fall. Cite this page: Carr, K.E. First Persian War – Ancient Greece. Quatr.us Study Guides, July 7, 2017. Web. April 25, 2019.